The story of six kids. Their encounters with antidepressant drugs. 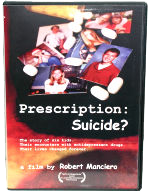 It is an unprecedented feature documentary built around intimately told personal stories of six American families, their hopes and experiences with antidepressant drugs prescribed to their children. As the film unfolds, we meet a range of individuals—some shy, some outspoken. Many have experienced tragedies and their pain is undeniable, yet with strength, humor and resilience, they love, care, struggle and speak for those who are no longer with us.